I have been a huge fan of Purex for awhile. As a matter of fact, as soon as I was on my own and had to not only do my own laundry, but pay for all of my laundry supplies, I quickly learned that Purex was my favorite. Purex is affordable and it works great. In my opinion Purex was already a college kids dream, but they have taken it even farther. 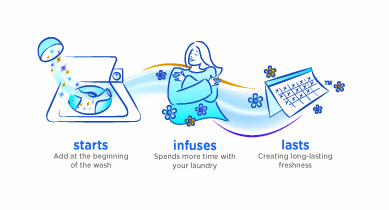 Purex keeps inventing new products to make doing laundry even quicker and easier while keeping our clothes smelling great. I am thrilled to announce that I am now a Purex Insider! What does this mean? It means that I am going to be working with Purex to bring you news, coupons, reviews and giveaways of their great products. First up is the new Purex Complete Crystals Softener. The Crystals are available in three lovely scents: Fresh Spring Waters, Lavender Blossom, and Tropical Splash. These innovative Crystals not only smell amazing, but they are super easy to use. You just measure the amount of Crystals you need into the lid and pour the Crystals into your laundry machine. The end result? Your clothes smell and feel amazing. The best part is the freshness lasts for much longer than other softeners. 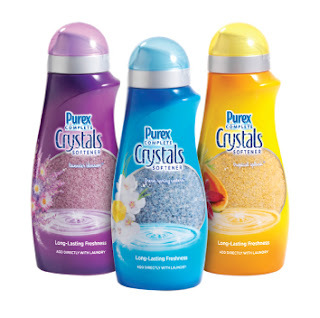 The Purex Complete Crystals are 92% Natural. So, they do not have the yucky oils that coat fabrics like your traditional softeners. Instead. the mostly natural Purex Complete Crystals infuse your fabrics with a long-lasting fragrance (it lasts for WEEKS, not hours!). The Crystals are also safe for all fabrics. So, you don't have to worry about them harming your favorite clothes. I was able to try both the Fresh Spring Waters and the Lavender Blossom Crystals. Both of the scents are incredible. I really loved the Crystals! They made my clothes feel and smell wonderful. They were also really easy to use. I admit it that the first time I used them I made sure all the Crystals dissolved. The second time I used them, I just tossed them on top of my clothes and left. I received the same result in both cases: great smelling, soft and clean clothes. Ohh and in case you are wondering what I used for detergent: Purex, of course! I use the Purex 3-in-1 sheets. I have not used anything else since these wonderful sheets were invented. Anyways, back to the Crystals. You can buy the Purex Complete Crystals Softener at most food, drug and mass retailers. They cost anywhere from $3.99 to $5.99 per bottle, and they are well worth it! Like Purex on Facebook and enter your name and email for a $1 off coupon! Visit Purex and come back here and tell me which of the "6 Sides of Purex" you are most excited about (hint: the "6 Sides of Purex" are on the page this link goes to..scroll down). Giveaway ends 03/18/11 at 9pm EST. Giveaway is for US residents only. No P.O. Boxes. Winner will be chosen randomly. Winner will be contacted via e-mail and then will have 48 hours to respond before a new winner will be chosen. I love the convience, you add it at the beginning of the load. I love that it is 92% natural! Can't beat that. Thank you for the great giveaway- AND the direct to the coupon! I left a message on Purex FB wall and tagged you and left a link to your giveaway! I like that it is 92% natural. The selling point for me is adding at the beginning of the wash. I have a Downy ball but don't always remember to put it in and end up missing the rinse cycle. I love their "fresh" side- I love the smell of clean laundry, love even more that it will last! shannon.knopf likes Purex on FB! shannon.knopf tagged you in a comment on purex's FB page! I like the natural, it is 92@% natural ingredients. I like that it's free of oil-based softening ingredients found in liquid softeners. I like that they are 92% natural. I like the clean part...no oil-based ingredients sounds great. I'm most excited about Fresh Scent that lasts for weeks, not days. I love their "fresh" side. I'm more excited that it's natural. i like that it is 92% natural! I am most excited about the convenience. I can never time it right to go back and add softener to the rinse water. This is incredibly easy! I like Purex on Facebook. I follow Purex on twitter as willitara. I follow you on twitter as willitara. I like the fresh side. Like Purex on FB & posted you sent me. I would love to win these! I've think they sound wonderful! I'm most excited about the Versatile side. My towels are gonna be AWESOME!